This specimen was originally illustrated in Frank Buckland's 1875 Log-book of a Fisherman and Zoologist. According to Buckland's account, he was presented with it by his servant while stationed at Windsor as an army surgeon, and told that the specimen had been found behind a chimney of the castle by some construction workers. One of the palace servants had then identified the skeleton as belonging to a favourite parrot of King Charles I.
Buckland confessed that, for a brief moment, the overall appearance of the specimen had him taken in. 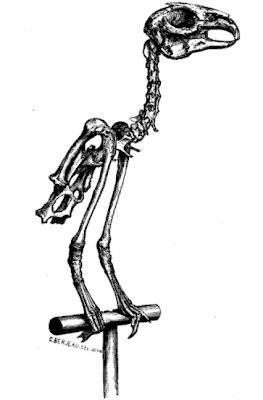 But it didn't take long for him to recognise it for what it was - the skeleton of a rabbit, cut in half with most of the thoracic skeleton removed, the neck and top part of the spine attached directly to the pelvis, and arranged in a position reminiscent of a bird. The construction workers and palace servants were themselves a complete fabrication. "King Charles I's parrot" became a favourite addition to Buckland's own collection. Buckland himself was something of a character, a trait inherited from his equally eccentric father William Buckland (known as describer of one of the first known non-avian dinosaurs, Megalosaurus, and for his determination to eat a representative of every species of the animal kingdom). For more Bucklandery, you could start at his Wikipedia entry, while the Log-book is freely available from the Internet Archive at the link above. If I'm understanding your account correctly, Buckland concluded that his servant had created this ingenious item? What was the guy's name? Seems like he should get credit. From the sounds of things, it was one of Buckland's fellow officers who instigated the hoax (Buckland doesn't mention his name). Doubtless the servant was in on the joke, though. I've just been reading about this is a book about 'fakes'. Do you know if the original skeleton is in a collection anywhere? Not that I'm aware of. As the skeleton itself was just an ordinary rabbit, I suspect that it probably would not have been considered worth keeping.